Plan a self-guided day trip in the Venetian Lagoon. ABOVE: Your excursion begins at the Fondamenta Nove waterbus station, which faces the Venetian Lagoon on the northern edge of the historic center. San Michele, the walled cemetery island of Venice. Murano, known for its glassmaking, Glass Museum, and several historic churches. Burano, an island of fishermen, lacemakers, and colorfully painted houses. Mazzorbo, a small rural island connected to Burano by a footbridge. Torcello, once a city larger than Venice; today, a bucolic island with a 1,000-year-old cathedral and a handful of outdoor restaurants. The Lido di Venezia, a beach resort on the strip of land that separates the Venetian Lagoon from the Adriatic Sea. 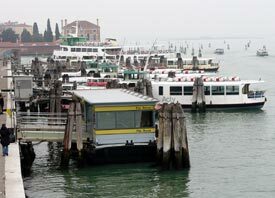 You'll reach the islands on water buses operated by ACTV, the Venice public-transportation company. Allow a full day for the entire excursion, or half a day if you skip San Michele and the Lido. Take an escorted tour of Murano, Burano, and Torcello. This half-day tour is more expensive than a tour by public transportation, but it's worth considering if your schedule is tighter than your budget. The trip is offered by Viator, our sightseeing-tour partner. Hire a water taxi by the half-day or day, which could easily cost several hundred euros. If you want the services of a private guide, try a customized lagoon itinerary from WalksInsideVenice or the Venice Tourist Guides Association and let the guide arrange transportation. Organized tours don't give you much time on the islands, so we'd recommend traveling independently unless you're in a hurry or have limited mobility. Instead of buying individual tickets for the boat trips between the islands, buy a one- to seven-day Tourist Travel Card at any Hellovenezia or ACTV ticket booth. If you have access to the Internet during your trip, you can check boat schedules at the official ACTV Web site. Looking for a smaller island that's even closer to Venice? Try La Certosa, which has a marina, a hotel, and acres of green space where kids and dogs can run free.